In a large bowl, sift together the flours, baking soda, and the salt. In another large bowl, combine the eggs, sugar, and oil. Mix well. Add about 1/4 of the dry ingredients to the wet ingredients, mix well. Add about 1/4 of the yogurt to the wet ingredients. Repeat, mixing back and forth between the yogurt and the dry mix, until fully incorporated. Using a disher or spoons, fill each cupcake paper 2/3 of the way full. Bake at 350 degrees F for 8-10 minutes, or until the centers are cooked. Cool on rack. Add the butter and a pinch of salt to a large mixing bowl, mix until the butter starts to soften. Little by little, mix the powdered sugar into the butter. Add the vanilla extract and strawberry puree to the bowl, mixing just until blended. Use a cupcake corer or a sharp paring knife to core each cooled cupcake. Use a small spoon to fill each hole with cheesecake filling. 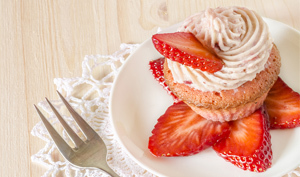 Spread a little more than a tablespoon of icing on each cupcake.